María del Carmen Amado came to United States 24 years ago, full of dreams. While she is dedicated to journalism for the last 30 years, 10 years of them to Westchester Hispano newspaper, her experience as an entrepreneur is not a coincidence.Maria has achieved experience in the corporate area in her youth when she worked during 4 years for the Romero Group in Lima, Peru, and waslucky to be assigned to companies group such stock market, real estate, textile, area of construction management, and investments as well.Before studying journalism, Maria studied tourism management and hotels, a career that was on fashion when she graduated from High School, and although she realizes that it is not a profession she is passionate about, decided to study five years, while she managed to study journalism -then her second career- and become a professional in this field as well. 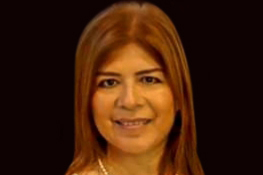 In New York, María began her U.S. career in El Nuevo Hudson (Spanish edition of the Jersey Journal) as a community news reporter. Then at WADO Radio (Univision) as a New Jersey Correspondent, then as a producer. Then she moved to Noticias 1380 24 Hours News Radio in NYC, as news editor, leading a team of 15 reporters, and working with important radio personalities such Malín Falú, Liliana Marín, Gelena Solano, and Alejandro Guerrero, former news director at Univision and Telemundo. María has also been in the television area with success. She was the producer at HITN for two years, and she and her team had won the Great Apple Award for the best New York City Community Television Program, presented by Mayor Rudy Giuliani. As part of her career she joined: Tiempos del Mundo and, Telemundo47, as a freelance reporter, and she did 3 years of wonderful service covering news in: the beat of Albany, New Jersey, Pennsylvania and Rhode Island, for EFE which is the largest worldwide news agency in Spanish. She is very happy to have served at Hoy New York as an Associate Editor and Assignment Editor, where she helped to important coverages such 9/11, AA 587 Flight Tragedy in Queens, and has intensively covering immigration issues and the lives of Latinos in NYC. After all her accomplishments, and having gained wide experience, Maria decides to create a local newspaper in Spanish to serve the Latino community in the county where she lives with her family. Then creates Westchester Hispano, and after great efforts and challenges, she managed to position Westchester Hispano and serve well the Hispanic Community, to which she is very proud of.Once she saw that everything was in order with WH, María decided to expand their services to the state of New Jersey which was the one who opened the door when she arrived from Peru, and gave her the opportunity to develop her career. Thus created in March 2015, New Jersey Hispano, a newspaper with news coverage and distribution in six counties in northern New Jersey.Due to the success of her own newspaper and her professional experience in 2011 she was named regional director of New York Press Association. In Perú, María has worked as a political writer, investigative reporter, news reporter for the largest Peruvian nationwide broadcasting RPP Group where she was the host of the political radio magazine “When the journalists talk” as well.